Sara's outdoor wedding took place at the Green Bench Brewery in Saint Petersburg Florida. This particular photo was taken in front of a colorful and beautiful mural located in the backyard of the brewery. This photo was taken during the family formals, directly following the wedding ceremony. I love family formals, it is the perfect opportunity to capture tender moments between the couple and their loved ones. As a photographer I get the opportunity to see and capture so many moments throughout the day that many do not get the chance to witness, moments such as this. 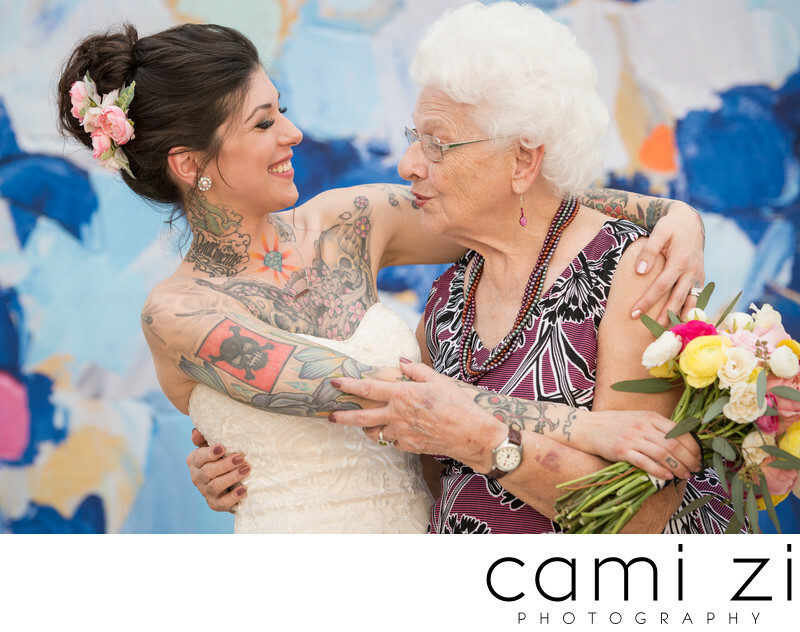 I adore this image because I got to capture my tough tattooed bride Sara listening to her sweet grandma's wise advice. I love that I get to capture and share these moments with my brides, and their loved ones. As the first microbrewery in St. Petersburg the Green Bench Brewery is rich with history. It was named after the iconic green benches that lined Central Avenue in St. Pete in the 1900s, these benches were known to bring the community together. The brewery has one of the original green benches located in the tasting room, along with the original bench they have several other green benches throughout the premises. Location: 1133 Baum Ave N, St. Petersburg, FL 33705.